1. Rub the tuna steaks with 1 tsp oil, season with the Cajun rub and set aside. Using a sharp knife, cut down the length of the corn on the cob to shave off the kernels. 2. Heat the remaining oil in a large frying pan over a high heat, add the corn and fry for 3-4 minutes until the kernels start to char slightly. Add the edamame beans and garlic, fry for a further 2-3 minutes then remove from the heat. Just before serving, squeeze over half of the lime juice and stir in the basil. 3. Meanwhile, heat a griddle pan over a high heat. Cook the tuna for 2-3 minutes on each side, or until cooked to your liking. 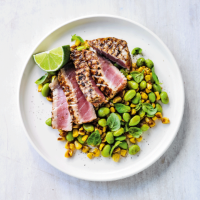 Slice the tuna and serve with the succotash and remaining lime wedges to squeeze over.